This study offers a discussion on the debt to Herodotus of Xenophon’s Hellenica with reference to the characterisation of Athenians and Spartans. It shows that some mythical accounts, such as the stories of the Amazons, Adrastus, the Heraclides, which developed after the Persian wars, were well-known from Herodotus onwards, both to historians and orators, and influenced the shaping of a crystallised image of the two cities: Athens appears as a magnanimous city, which helps all victims of injustice, Sparta is instead a selfish city. There is a good deal of common places about these two cities in Xenophon’s time, and some topoi were probably also shared by others. This work intends to focus on the nature of the relationship between Eubulus, Xenophon and his Poroi. At the present we do not know if Xenophon’s Poroi was an open letter to the polis’ officers or an attempt to offer a new economic and political programme, maybe both of them. By comparing the available evidence (literary sources, epigraphic data and archaeological evidence) with all the proposals and claims made by Xenophon in his last work, I have tried to answer this question and to discover how many of Xenophon’s proposals were carried out, by who and in which cases Xenophon’s advice preceded some Athenian reforms. In Herodian’s historical view the demos appears to play an important political role in critical stages of the Roman empire. The political success of an emperor depends on the popular approval in Rome or in the provincial cities, besides the support of the soldiers. The analysis of the words demos and ochlos, used by Herodian with different values, reveals that the historian cannot be defined filopopular, but shows throughout interest in the popular partecipation in civil struggles. This article starts from the exegesis of the mythical tradition about Daedalus and Minos in Sicily, considered as a product of a historic reality, that is the foundation of Gela by the Rhodium-cretan apoikoi. In particular, the work intends to survey the connection between the above-mentioned tradition and the one concerning the foundation of the apoikia, as well as to reconstruct the evolution of the mythical tradition, basing on literary sources and archaeological evidence. Lastly, by comparing the versions of Herodotus and Diodorus of Sicily, this article aims to demonstrate the congruence of the choices made by these authors and also to provide useful elements for the exegesis of some unclear sources (Antioch., FGrHist 555 F 13 = Strab. VI 3, 2). The inauguration of the Athena Nike cult in archaic Athens during the second quarter of the sixth century is undoubtedly associated with the reorganization of the Panathenaea in 566 BC and with the victory of the goddess against the giants, a topic closely linked to the penteteric festival. Through the examination of the Athenian versions of this Panhellenic myth, which involve characters like Erichthonius or the Pallantids, it is argued that the cult of Nike and its mythical elaborations could be associated to the claim of victory by one or another faction in the context of the stasis that marked the Athenian history of the sixth century. In the fifth book of his Geography, Strabo describes the ancient colony of Neapolis in imperial age, noting that «very many traces of Greek culture are preserved there – gymnasia, ephebeia, phratriae, and Greek names of things, although the people are Romans». This passage poses two important issues concerning respectively: the Strabo’s position towards Rome; the status of Neapolis’ Greek identity in Augustan age and his relationship with the imperial power. Solon, named archon, was also entrusted with the task of giving laws to Athens. Thanks to Plutarch we know some of these new laws and the difficulties encountered by Solon in making them accepted. Great was the discontent of the wealthier for the laws on heiresses, protected as women in marriage, and on wills, with which even a person who was not part of the family could be named an heir. On the other hand, the poor were dissatisfied with the laws that prohibited the sale of girls, daughters and sisters, and with some of those that regulated life in the countryside. In formulating some laws to protect women, sons and daughters, Solon could draw inspiration from the Code of Hammurabi. This paper focuses on funerary architectures of ancient Tegianum, a municipium of Roman Lucania. The current city of Teggiano has very few ancient monuments still visible but there is an extraordinary amount of spolia, reused in churches and city buildings. The analysis of these materials (i. e.: steles with Oscan and Latin inscriptions, doric friezes and coffered ceilings), although decontextualized, allows us to reconstruct the development of funerary use and architectures between the end of the 2nd Century BC and the early Imperial Age. In this perspective we discuss the cultural and artistic relationships between the lucanian municipium, the Greek cities of Southern Italy and Eastern Mediterranean, and the new cultural models dictated from Rome. Barthold Georg Niebuhr, Storie di eroi greci raccontate a mio figlio, a cura di C. Montepaone, traduzione e note di M. Catarzi. 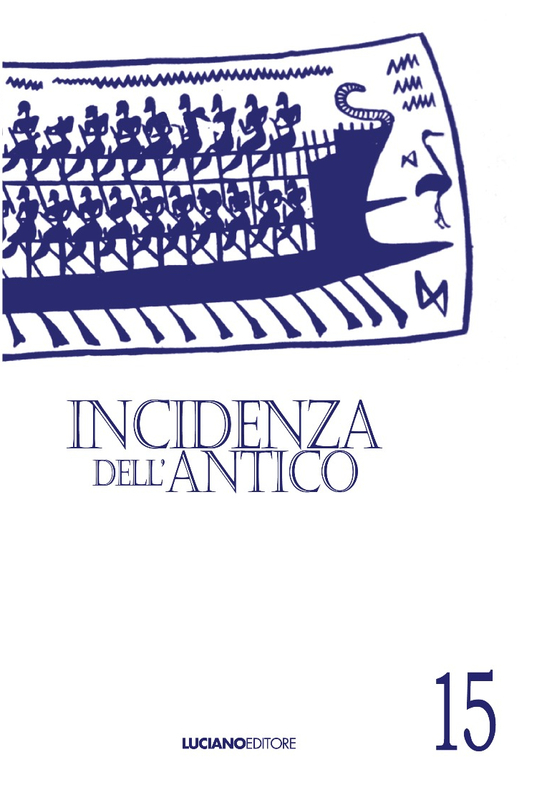 Edizioni di Storia e Letteratura (Letture di pensiero e d’arte, 111), Roma 2016, pp. XXVI-105. ISBN 978-88-6372-957-7. Gli oggetti sulla scena teatrale ateniese. Funzione rappresentazione comunicazione (Giornate internazionali studio, Università degli Studi di Padova, 1-2 dicembre 2015), a cura di A. Coppola, C. Barone, M. Salvadori. CLEUP, Padova 2016, pp. 587. ISBN 978-88-6787-672-3. Richard Evans, Ancient Syracuse. From Foundation to Fourth Century Collapse. Routledge, London - New York 2016, pp. XVIII-241. ISBN 978-1-4724-1937-8.